Preheat oven to 375° F. Paper line 12 muffin cups. Combine 2 tablespoons cheese and bread crumbs in small bowl; set aside. Heat butter in medium saucepan over medium heat. Add flour and cook for one minute stirring constantly. Gradually add milk, stirring constantly, until mixture begins to thicken. Add pasta, remaining cheese, salt, garlic powder and hot pepper sauce (optional). Stir until cheese is melted and pasta is evenly coated. Remove from heat; cool for 15 minutes. 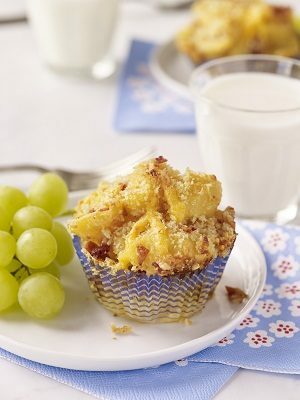 Evenly divide pasta mixture into prepared muffin cups. Gently press down on mixture to compact. Sprinkle evenly with cheese and bread crumbs. Bake for 20 to 25 minutes until tops are golden brown. Cool for 10 minutes.